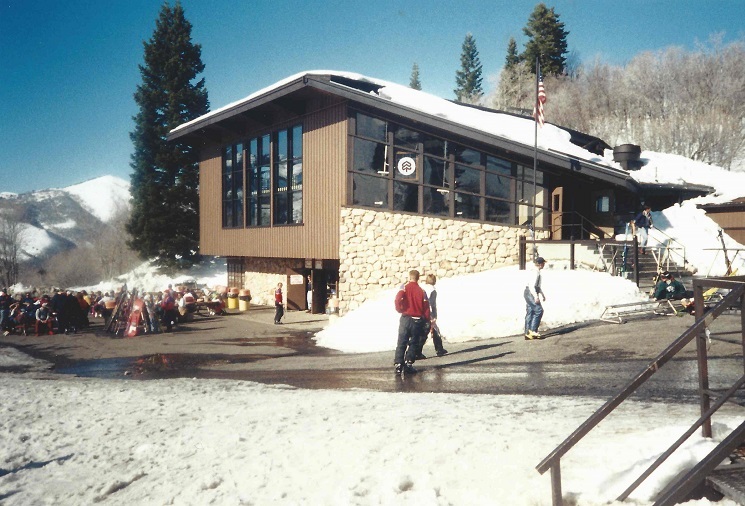 The 1990's at Snowbasin began as a local's ski area with secret powder stashes, live music on the patio and short lift lines. “Utah's Best Kept Secret” would see it's last decade as a little ski area. Big plans were on the horizon and the 90's would closeout with a “bear of a downhill course”, a world-class snowmaking system, state-of-the-art high-speed lifts and a brand new access road. 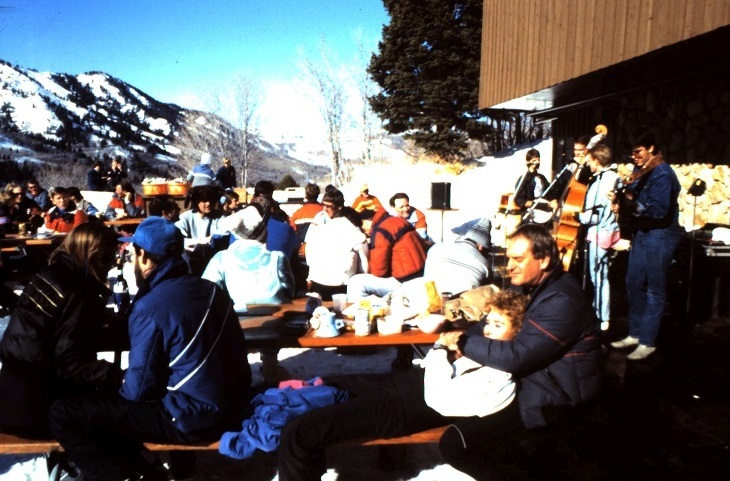 One of my fond memories of the 1980's and 1990's was listening to live music on the patio of the old Snowbasin lodge with the smell of juicy burgers and jumbo hot dogs on the grill. I remember that you could hear the music all the way up Wildcat Lift. Local bands jammed every Saturday and Sunday when the weather permitted and skiers would hang out on the picnic style tables enjoying the sun, snow and a cold one. 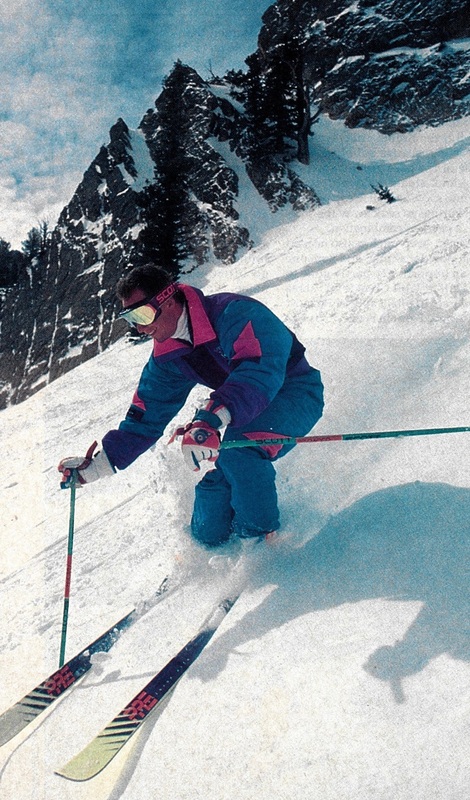 Parabolic skis began development in the early 1990's. The company that drove the evolution of the new ski design was Elan. 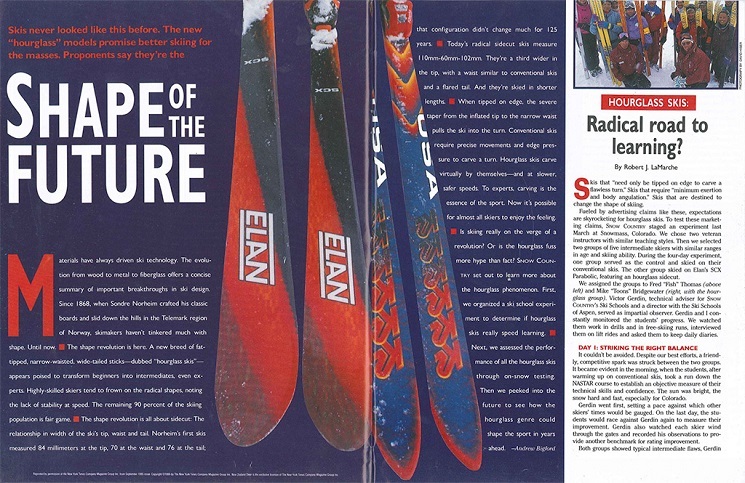 In 1993 the Elan “Sidecut Extreme” (SCX) was named “ski of the year” and by the end of 1997 only parabolic skis were being produced and older designs were being sold off at pennies on the dollar in bargain bins. The parabolic ski revolutionized skiing by shortening the learning curve by allowing beginners to perform the efficient carved turn quicker. By the end of the 1990s the term “parbolic skis” was refered to as “Shape Skis”. 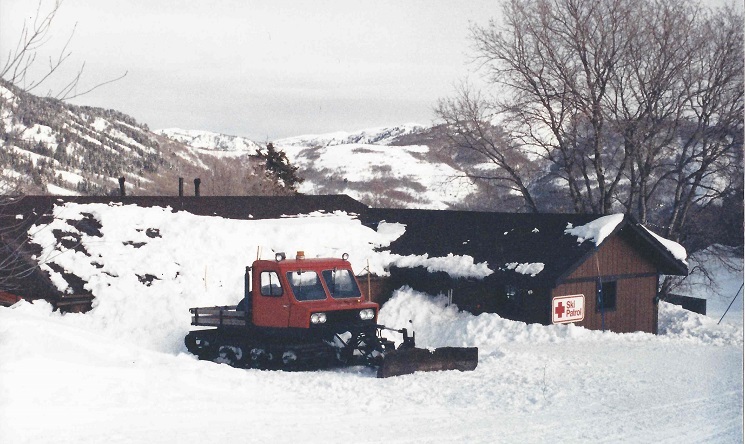 In 1996 a land exchange between the U.S. Forest Service and Snowbasin was completed after close to a decade of development. 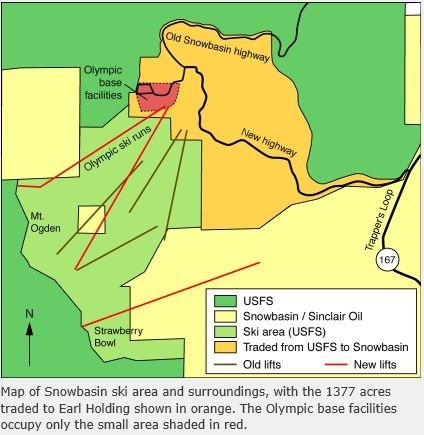 The exchange gave the Forest Service 11,757 acres for its National Forest while Snowbasin picked up 1,377 acres of federal lands around the ski area's base area in order to develop new facilities in preparation of the 2002 Winter Olympics. The land swap was approved by Congress and President Clinton in the fall of 1996 as the Snowbasin Land Exchange Act which was part of the larger Omnibus Parks and Public Lands Bill. 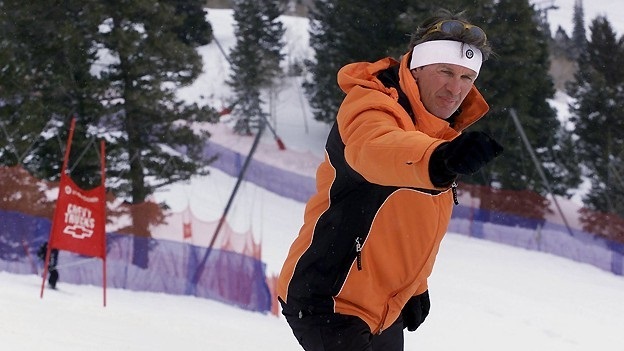 In 1995, former Swiss downhill ace Bernhard Russi began walking and skiing the steep, tree-shaded slopes to the west of the then-existing ski area. Since retiring from World Cup racing, Russi has become one of the world’s foremost designers of downhill courses. He designed courses for the 1992 Olympic Games in Albertville, France, the 1994 games in Lillehammer, Norway, and the 1998 games in Nagano, Japan. Completed in the summer of '98 the 2002 Winter Olympic Downhill Men's course was named “Grizzly” The name Grizzly has local meaning to the Northern Utah area. As local legend has it, a grizzly bear nick-named Old Ephraim roamed in the area back in the early 1900s. Old Ephraim was a gigantic, ruthless bear that outsmarted sheephearders and hunters for years. 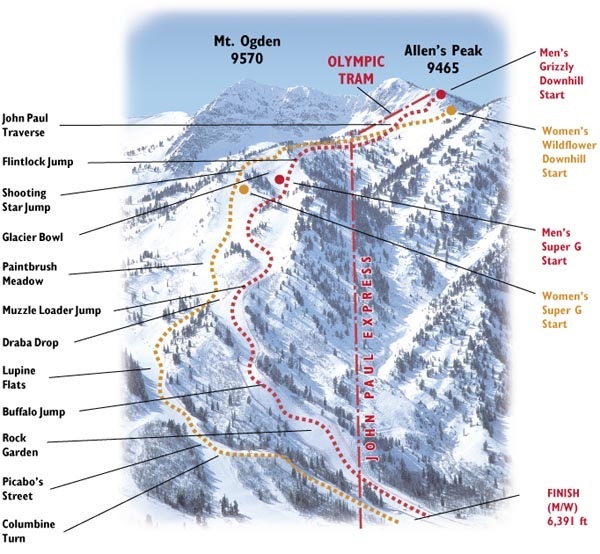 Snowbasin has named different parts of the course using the rich history tied to Old Ephraim and the western spirit tied to Ogden. Started at the highest altitude of all Olympic downhill races up to 2002, at 1.759 miles with a vertical drop of 2900 vertical feet and at a 74 percent grade it was amongst the shortest, quickest descending and fastest Olympic downhills ever. The Grizzly has been described as the most difficult downhill in the United States—or the “Kitzbuhel of North America,” a reference to the Hahnenkamm downhill in Kitzbuhel, Austria, widely acknowledged as the fastest and most treacherous in the world. The Women's course - Wildflower, named after the abundance of natural wildflowers on Mt. Ogden. The Wildflower course has been compared to the women's World Cup downhills in Bad Kleinkircheim in Austria and the Veysonnaz in Switzerland, with plenty of gliding areas pettered with steep, technical pitches. The 10,302-foot long course, brings together a blend of wide open gliding paths and steep, technical areas that will show both the beauty and power of the sport. This steep and challenging run begins at 9,016 feet and drops 2,625 feet to finish on slopes that at times reach a 58 percent grade. 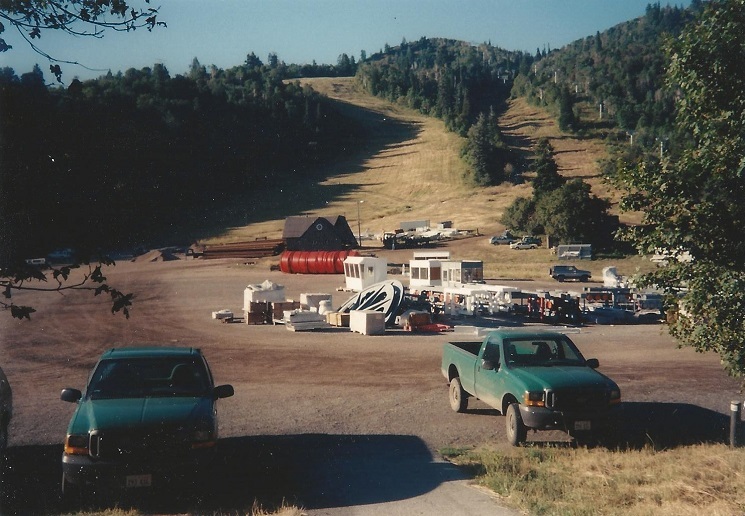 In the Summer of 1998 the expansion we had all been waiting for since Sun Valley purchased Snowbasin was finally happening. Four new lifts were constructed: two eight passenger gondolas, one high-speed detachable quad chair and one jig-back tram. The Strawberry Express gondola is 9,576 feet long, has a vertical rise of 2,472 feet, and carries 2,400 passengers per hour. The Middle Bowl Express (now known as Needles Express) gondola is 9,494 feet in length with a vertical rise of 2,310 feet. It also has a 2,400 passenger capability. The John Paul Express is a high-speed detachable quad chair lift, 7,748 feet in length with a vertical rise of 2,424 feet and a 2,400 passenger per hour capability. 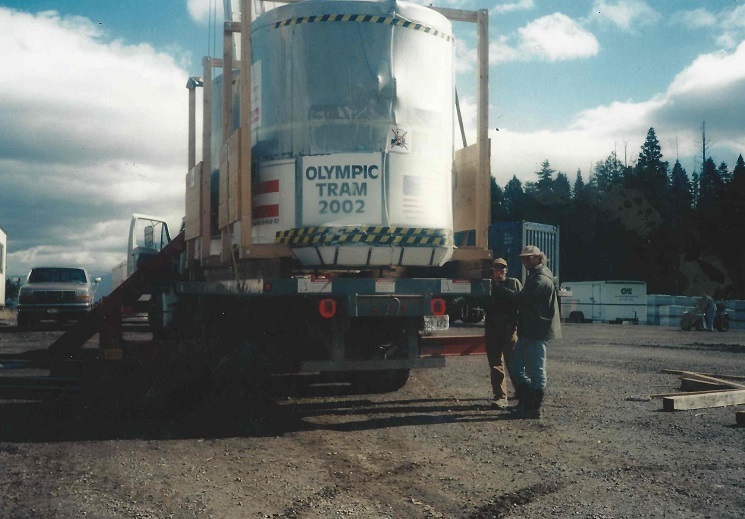 The Olympic Tram (now known as Mt. Allen Tram) runs from the top of John Paul to Mt. Allen. It is 1,165 feet long with a 510-foot vertical rise and a passenger capacity of 450 per hour. Mother Nature is by far the best option for blanketing the mountain with Utah's best powder but unfortunantly we can't depend on a consistant winter from year to year so one of the great features added to Snowbasin in the summer of 1999 was a world-class snowmaking system. The installation of an automated system enables the resort to open earlier and extend the season into the spring. 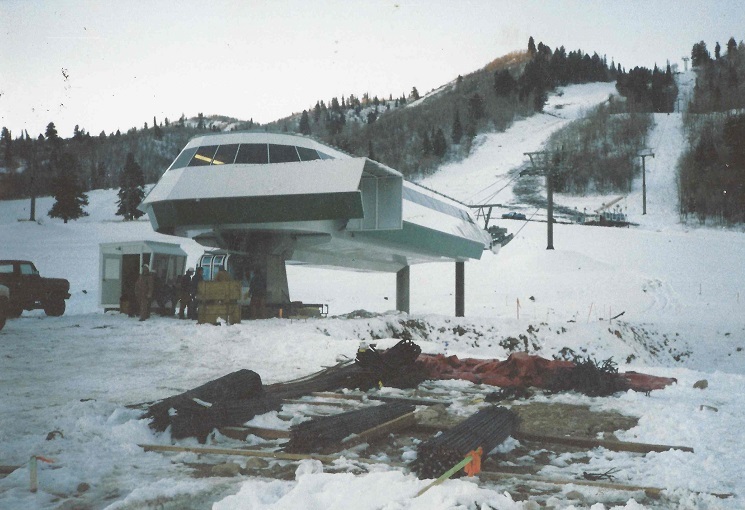 Snowbasin's system, at the time of installation in 1999, was the most advanced snowmaking system in the world, using the most up-to-date technology and equipment. With more than 300 miles of wiring, 50 miles of electrical conduit and 47 miles of pipe, Snowbasin's snowmaking system covers over 600 acres (24 runs, approximately 23 miles) of skiable terrain. Sun Valley, Snowbasin's sister resort, and Snowbasin Resort are now among the two largest snowmaking operations in North America. 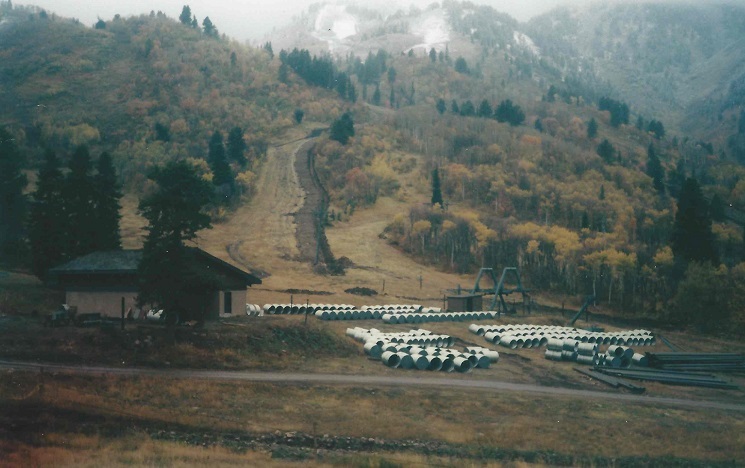 Snowbasin Resort's elaborate system enables the mountain to make snow of different consistencies. To please powder lovers, the snowmakers can make dry, light snow. For the Olympic downhill courses, Grizzly and Wildflower, the snow can be made hard and packed, just the way the racers like it. The central computer system, located inside the snowmaking building, obtains information from the 104 various weather stations around the resort, checking the weather every 15 minutes and adjusting the guns to make the best possible snow based on local temperature and humidity. Cooling towers lower the water temperature from 47 to 32 degrees for optimal snowmaking. There are 521 snowmaking guns and 8 manual guns on the mountain. Each snowmaking gun covers an area of 120 feet by 120 feet which in ideal conditions can cover up to four inches from each gun in a 10-hour period. 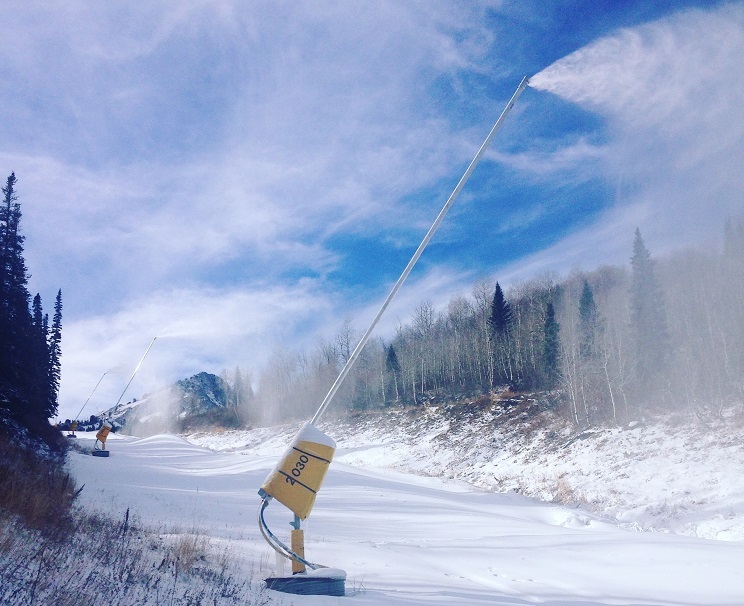 Snowbasin Resort has been keeping up with snowmaking technology and has recently upgraded and replaced most of the original snow guns with Rubis Evo snow guns which increase snowmaking efficiency and use much less electricity. 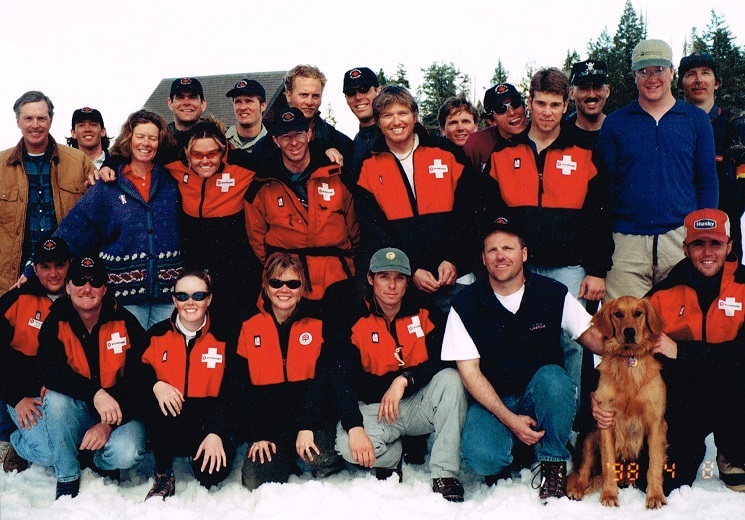 I can't say enough about the Snowbasin Ski Patrol and I have tried to include this awesome department in most of the blog installments. Below are a few photo sent to me that I wanted to share. One of the many reasons I ski Snowbasin Resort is “convenience” and when the new road to Snowbasin was completed in 2000 a huge “convenience” was added. No longer did I have to use the long and winding road that is now called “Old Snowbasin Road”. The new road cut down my driving time. It made it possible to reach Snowbasin in 30 minutes from the South Ogden area. 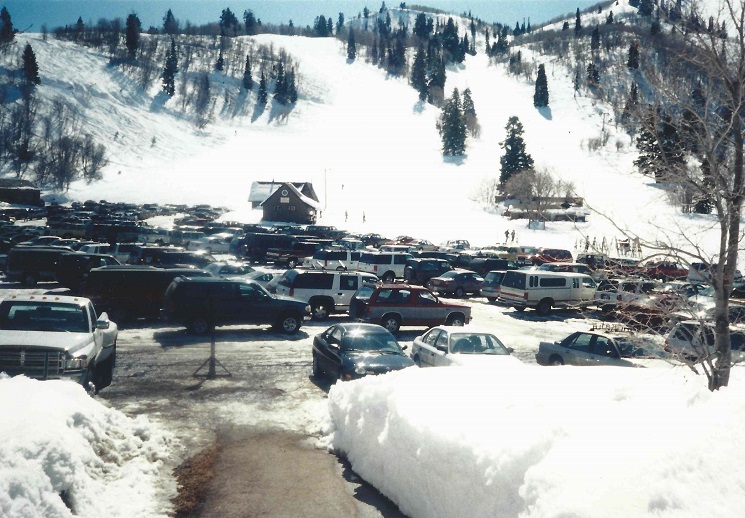 It also made it possible to reach Snowbasin in less than an hour from Salt Lake International Airport which brought Snowbasin into the playing field with the Park City and Salt Lake Resorts for bringing in tourists. 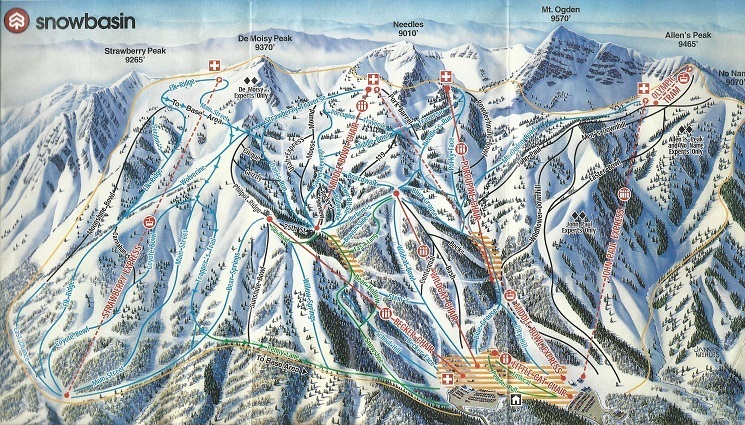 Above: Map of Snowbasin at the end of the 1990s.